Technology is on the brink of enabling fully autonomous unmanned aircraft system (UAS) operations that can supersede the role of humans in every respect. However, in the United States (USA), the regulatory structure for these aircraft remains in its nascent stage. The Federal Aviation Administration’s (FAA) current UAS regulations, based on the existing regulatory model applicable to manned aircraft, place the Remote Pilot in Charge (RPIC) as central actor in UAS operations, responsible for safety of flight. Specifically, the FAA requires the RPIC, unaided by technology, to “see and avoid” hazards and mitigate the potential of midair collisions. To the extent that humans become further, or even entirely, removed from UAS flight operations, autonomous UAS flight challenges both the letter and intent of this regulatory scheme. 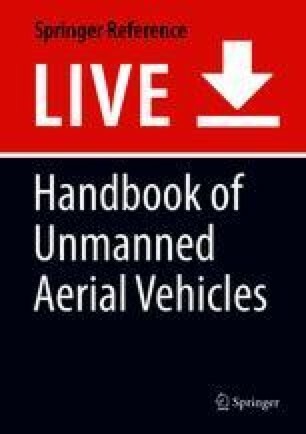 This chapter reviews current FAA regulations in light of anticipated technological advances and current research and development efforts and proposes regulatory suggestions and structural changes required to enable autonomous UAS flights in the US national airspace system (NAS) based on a new philosophical paradigm in which the RPIC is no longer central to flight safety. To do this, Part I summarizes relevant UAS regulations relating to public and nonpublic UAS operational requirements and waivers thereto, as well as the rationale behind them. Part II identifies different types of technological advances necessary to mitigate concerns associated with UAS flight safety in general and as applicable to autonomous flight, such as first person view, traffic collision avoidance systems (T-CAS), and Automatic Dependent Surveillance-Broadcast (ADS-B). Part III discussed structural mitigation measures that will need to be taken into account, in parallel with those technical measures, using the National Aviation and Space Agency’s (NASA) unmanned traffic management (UTM) initiative as a baseline. Part IV discusses current research and development efforts relevant to enabling autonomous UAS operations in the NAS, with an emphasis on the FAA’s Pathfinder Program. Part V explores potential regulatory improvements that will be required once sufficient technological and structural developments exist. Part VI concludes by summarizing the regulatory and other changes necessary to enable safe, efficient, and effective autonomous UAS operations in the US NAS. Autonomous systems are a part of everyday life. Tesla recently introduced the Model S and Model X line of automobiles, which have self-drive capabilities including the ability to self-park (Tesla 2017). Other commonly accepted autonomous systems include automatic emergency braking for vehicles and even house-cleaning robots, to name a few (NHTSA; Miele). Most manned and unmanned aircraft systems (UASs) today are semiautonomous. Yet for many, the idea of fully autonomous UAS operations in the US national airspace system (NAS) seems a bridge too far. In the United States, the Federal Aviation Administration (FAA) regulatory model applicable to UAS places the Remote Pilot in Charge (RPIC) as the lynchpin to safe UAS operations. Autonomous flight challenges this construct and its underlying philosophical assumption that man, unaided by technology, is best postured to “see and avoid” hazards and mitigate the potential of midair collisions. However, it’s just a matter of time before technology enables fully autonomous UAS operations that can supersede the role of humans in every respect. Just as the engineers who are attempting this push current limits in this regard, regulators should likewise lean forward and consider the “how to” for the “what if.” The purpose of this chapter is to review current FAA regulations in light of anticipated technological advances, structural requirements, and relevant research and development to propose regulatory suggestions to enable autonomous UAS flights in the US NAS. The FAA views that UASs are “aircraft” (14 CFR § 107.3). It is for this reason that the FAA has simply modified its regulations, originally written for manned flight, to apply to UAS. However, underpinning these original regulations was the assumption that there would be an onboard pilot. At the heart of the safety paradigm is the requirement that the aircraft operator maintain vigilance so as to “see and avoid” other aircraft (14 CFR § 91.113(b)). This requires that during flight, a pilot on board the aircraft, look out of the aircraft, and not be hindered by “cockpit duties” to observe whether his and other aircraft are on a collision path (33 FR 10505 (July 24, 1968)). Because UAS does not have an onboard pilot, they use conflicts with the critical “see and avoid” requirement applicable to general aircraft. In addition to the plain language of the text, the history of the “see and avoid” language makes clear that the drafters did not contemplate the use of technology to substitute for human vision. The genesis of this requirement can be found in two Civil Air Regulations (CAR), both of which preceded the FAA’s original 1968 rulemaking (CAR sections 60.13(c) and 60.30). Specifically, the CARs attempted to mitigate in-air collisions by requiring pilots to focus their attention outside the aircraft to ensure the path was clear. Because unmanned flight cannot technically meet the letter of the “see and avoid” requirements, the FAA’s treatment of UAS has focused on mitigating the risk of collision through operational parameters. Title 14 of the Code of Federal Regulations (CFR) Section 107.31 addresses “see and avoid” through the visual line of sight (VLOS) requirement, to be exercised by either the RPIC or the visual observer (VO). These individuals must: (1) know the UAS’ location; (2) determine the UAS’ attitude, altitude, and direction of flight; (3) observe the airspace for other air traffic and hazards; and (4) determine that the UAS does not endanger the life or property of another, throughout the duration of the entire flight (14 CFR § 107.31). The VLOS requirements apply to all UAS, regardless of type or purpose, and focus on the RPIC as the central means to “see and avoid” other aircraft to ensure safe UAS operations. All UAS must also follow other strict operational parameters as well, depending on their category. Public use UAS (governmental or military) restrictions are typically contained in a FAA Certificate of Authorization (COA). Nonpublic use UAS (private or commercial operations) restrictions are contained within 14 CFR Part 107: Small Unmanned Aircraft Systems (Part 107). Depending upon which category (public or nonpublic) operations are flown, the restrictions applied can vary. Additional restrictions imposed on public and private use UAS relate to the size and capabilities of the UAS involved, as illustrated by a comparison of a small private/commercial use UAS (DJI Inspire) to a large military RPA, below. Within the public use category, which generally applies to government and military UAS/RPA (remotely piloted aircraft) operations, the FAA COA lists various restrictions that require compliance. Unless otherwise authorized as a special provision, typically a maximum of one UAS may be controlled from a single control station and only by one qualified RPIC at a time (14 CFR § 107.35). Other typical restrictions include, but are not limited to, location of operations with altitude restrictions, when operations are authorized (day vs. night hours), and VLOS requirements (FAA FORM 7711-1 UAS COA Attachment, 2015-WSA-52-COA). Large commercial UAS or military RPAs also have to follow certain restrictions to operate in the NAS in accordance with either approved FAA COAs or Part 107. Much like small UAS, large RPAs lack a “see and avoid” capability. However, this concern is mitigated by the requirement that these RPAs operate in designated or restricted airspace. This allows the FAA to safely separate large UAS and RPAs, which require large areas of airspace to operate, from civilian and commercial air traffic that are not authorized to operate in these airspaces. Currently the FAA also utilizes temporary flight restrictions (TFRs) over military airfields from which RPAs launch and recover. For example, the RQ-4 Global Hawk at Beale Air Force Base, California, requires a TFR to be activated over its airfield before it launches and recovers RPAs. The TFR begins at 4100 ft mean sea level (MSL) and extends upward to 18,000 ft MSL for a 10-nautical mile radius around the airfield (NOTAM Number: FDC 7/8369. Issued January 29, 2017). This ensures that all nonparticipating aircraft that are not communicating with air traffic control (ATC) or aircraft without the ability to be seen on ATC radar remain clear of the airspace. For the nonpublic use category, which includes most private or commercial for-hire UAS operations, Part 107 also lists various restrictions. Like the FAA COA, Part 107 also states that an RPIC can only operate one unmanned aircraft at a time (14 CFR § 107.35). Other restrictions for nonpublic UAS are similar to those found in most FAA COAs and include daylight operations only, VLOS, and prohibitions on operating from a moving vehicle (14 CFR § 107.205). The DJI Inspire, one of the most common UASs used in video filmography, is a battery-powered UAS with a limited GPS-enabled navigation system capable of short flight durations, around 20 min (DJI 2017a). With the DJI Inspire, the RPIC is able to control the UAS using a handheld controller typically connected to a tablet for enhanced flight controls and situational awareness. The DJI Inspire also has a full mission video (FMV) camera which can be controlled by either the RPIC or a second person serving as the sensor operator (SO), who can control the camera via a hand controller and tablet device (DJI 2017b). Some UAS can already fly autonomously, but much work goes into ensuring this can happen safely, such as setting specific flight parameters and obstacles to avoid. Other UASs can fly preprogrammed waypoints, but the current requirement is that a pilot can take control if something goes wrong. Due to its small size and “simple” navigation system, the DJI Inspire must follow a myriad of restrictions to legally operate in the NAS. First, all operations must be done during daylight hours. This is to ensure the RPIC can see the UAS at all times. If an activity requires the DJI Inspire to fly after daylight hours, the RPIC must apply for a waiver to 14 CFR § 107.29 and show the DJI Inspire has appropriate lighting, which is visible for at least 3 statute miles. 14 CFR § 107.37 contains another common restrictions for small-sized UAS, Operation near aircraft; right-of-way rules. Under this provision, the RPIC is held responsible for yielding the right of way to all aircraft, airborne vehicles, and launch and reentry vehicles. This is due to the small size of the UAS and the inability of manned aircraft to properly see the UAS. Of all the restrictions typically levied on small UAS operations, such when using the DJI Inspire, one of the most significant is 14 CFR § 107.31, visual line of sight aircraft operations. Under this section, the RPIC or VO, if used, is required to keep the UAS under unaided visual sight at all times. Much like 14 CFR § 107.37, the basis of this rule is to ensure flight safety between the UAS, other aircraft, and persons not involved with the UAS operations. Because of the small size and lack of an onboard pilot, small UAS do not have “see and avoid” capability like manned aircraft. If the RPIC or VO loses sight of the UAS or the data link is broken, there is no way to ensure the UAS will not collide with another aircraft, person, or object. The FAA established these restrictions in the public use COA and nonpublic use Part 107 based on the historical context of their existing regulations, technologies being used in UAS at the time they were created, as well as due to concerns for citizens’ safety when operating in or around populated areas or other manned and unmanned aircraft. However, recognizing that technology advances much more rapidly than regulation can be written, all of these FAA operational requirements, whether for large or small and public or nonpublic UAS, may be waived. Both the public use COA and Part 107 have procedures to request waivers from any and all restrictions listed. The FAA may grant a waiver and authorize deviations from certain regulations such as daylight operations, VLOS, VO, operation of multiple UAS, yielding the right of way, and operations over people and in certain airspace (14 CFR § 107.205). However, it is the responsibility of the group requesting the waiver to provide sufficient proof that operating outside a certain restriction can be accomplished safely, by providing documented operational procedures to demonstrate a level of safety acceptable to the FAA. Waivers are time-consuming as the FAA determines if the requested deviation and proposed plan allow for safe operation of the UAS. If the waiver request does not provide sufficient detail for the FAA to adjudicate the waiver, then the request is denied. Since Part 107 went into effect in August 2016, the FAA has granted multiple waivers to businesses for UAS commercial operations (FAA 2017). Most of the granted requests are waivers to fly during nighttime conditions. With technological advances and the increase in UAS use for commercial purposes, more requests are being submitted to waive the requirements of 14 CFR § 107.35, operation of multiple small unmanned aircraft systems. For example, Walt Disney World made history in 2016 by flying 300 small UAS simultaneously to create a magical light show. This feat was accomplished under the umbrella of Walt Disney World’s approved FAA waiver to fly at night and to allow one controller to operate more than one small UAS at a time (Kaplan 2016). Furthermore, PrecisionHawk, who has teamed with the FAA as described below, requested and received a COA to waive the visual line of sight requirement of 14 CFR § 107.31 and modify the visual observer requirements found in 14 CFR § 107.33 (b) and (c)(2). These waivers will allow PrecisionHawk to continue with its air traffic management and UAS software research. Additionally, the FAA is currently granting more waivers for 4 years. Waivers, while valuable, are time-consuming and never guaranteed. As autonomous operation is the future of UAS, then the waiver process, which is currently the exception to the rule, is not the most effective or efficient way to authorize such flights. As technologies to ensure safe autonomous UAS flight become tested, validated, and eventually mainstream, regulations will need to be adapted to fully enable these operations. A review of specific types of technology needed to achieve the goal of true autonomy, and safety of flight, appears below. As technology advances for UAS, the goal of most developers has been to create autonomous systems. Most current systems amount to advanced automation, rather than advanced autonomy (Turnbull 2014). A truly autonomous system would be able to observe its surroundings and system status, interpret those readings, and adapt itself to an ever-changing situation, just as a human would. In the basic sense, if you equate UAS autonomy to the philosophical definition of autonomy, then a UAS would be able to reflect on the situation, choose a path based upon external and internal factors, and then act on that choice, which equates to internal self-reflection and procedural independence (Christman 2015). Such systems would permit UAS to be operated with no RPIC at all. Companies such as Amazon and UPS are working to develop this type of technology. Amazon is considering a new service called Prime Air which would have an autonomous UAS that delivers a package to a customer within 30 min (Amazon 2017). UPS is also already testing a package delivery system. However, without an approved waiver, its testing had the UAS take off and land on a parked delivery truck with the UAS remaining in the UPS controller’s visual line of sight at all times (BI Intelligence 2017). Ideally these small UAS would be able to deliver packages autonomously without direct human oversight of the operation. The US government is also spending a considerable amount of time and resources to develop autonomous UAS for both military and nonmilitary use. For example, NASA and the Air Force Research Laboratory (AFRL) have been working together to create an autonomous UAS that can plan its own mission, launch, navigate, and refuel all on its own (Norris 2016). If the system is fully realized, the small Traveler UAS would autonomously launch once it received data that an accident had occurred and would then respond to the medical emergency. For example, if a person was injured in a remote area, such as the side of the mountain or on a country road, once that person called 911, the UAS would realize it can respond to the emergency. To respond, the UAS would plan its flight, file a flight plan, launch once the proper medical supplies were loaded, self-navigate to the victim, land, and deliver the needed supplies. It would also be able to plan for in-flight refueling from another UAS if a long flight was required. Additionally, upon landing it could establish a communications link between the victim and medical personnel (Norris 2016). This system has far-reaching potential, not just for medical missions, but also could apply to any other type of aid, recovery, or observation mission where an immediate human presence is not required. The autonomous UAS would evaluate its system capabilities and potential risks and then decide if it wants to take off to accomplish the certain mission. As both public agencies and private industry experiment with advanced autonomous technology, the consensus as to the largest challenge to achieve the best solution to address the “see and avoid” issue. The NAS consists of fluid highways of aircraft traveling in various directions, speeds, and altitudes. To operate in the NAS, all pilots must follow set procedures and follow the directions from ATC. Ultimately, it is always the responsibility of the PIC to see other aircraft and avoid them if needed. Currently, UAS has a limited to no field of view when it comes to seeing other aircraft or terrain. This makes it exceedingly difficult for a UAS to function in airspace where other aircraft are operating. Even simple rerouting of aircraft due to weather or delays sends out a ripple effect to all other aircraft in the area. Altitude adjustments and heading changes can cause already congested airspace to become logjams of aircraft with minimal spacing. ATC radar, when available, can help pilots safely navigate through these logjams, but if a pilot or radar controller is not paying attention, the results could be catastrophic. Add to this situation a UAS, large or small, where the RPIC is relying on a limited or no field of view and a potentially tenuous communications link to evaluate the situation and respond correctly or an autonomous system relying on preprogrammed responses that do not account for dynamic reaction to an ever-changing environment, and the significant safety concerns are apparent. With the advancement of technologies to better integrate UAS/RPAs into the NAS, current R&D efforts are forcing a shift from the concept of “see and avoid,” which requires a person “in the cockpit” to avoid other aircraft, to a “sense and avoid” concept. Under this concept, the previously described technologies would allow the RPIC to build an airspace picture of what is around their aircraft as well as alert air traffic control (ATC) or other manned aircraft to the presence of a UAS or RPA in their immediate area. This would allow both the RPIC and the manned aircraft pilot to react to potential hazards and take appropriate actions to avoid potential collisions. This, and any future technology, could then be applied to allow autonomous flight operations of UAS and RPAs. In order to meet “see and avoid,” or ultimately “sense and avoid,” requirements, there have been many attempts from both commercial industry and the military to give UAS and RPAs either “eyes” to see other aircraft or the ability to ensure avoidance of other aircraft or obstructions. Current technology includes UAS-mounted cameras, so the RPIC can see other aircraft or obstructions to flight through first person view (FPV). To avoid other aircraft, there are also efforts to install either traffic collision avoidance systems (TCAS) or Automatic Dependent Surveillance-Broadcast (ADS-B) systems. Additionally, the use of geofencing is being used to contain small UAS in certain areas. On the commercial operations side, many of the smaller UAS have adopted first person view (FPV) technology. Using FPV technology, a camera on the nose of the aircraft is able to stream a video feed directly to the RPIC and onto a mountable screen on the controller or a headset goggle. With FPV, the RPIC is able to directly see where the UAS is heading. This type of technology is already in use by some military RPAs, by use of either a fixed or gimbal-mounted video camera. On the RQ-4 (military RPA) there is a fixed thermal camera able to provide the pilot a view of the taxiway and runway during launch and recovery operations. The MQ-1 and MQ-9 have multiple cameras which the pilot can use during all stages of flight. While these technologies give the RPIC a better view of what is going on around their aircraft, they are still limited as they provide only a “soda-straw” view depending on the cameras field of view. As technology has allowed systems to become smaller, companies are now able to develop smaller versions of both TCAS and ADS-B. With these systems, the RPIC is able to broadcast their position to other aircraft with similar systems on board. The RQ-4 was developed and equipped with a TCAS system, and in the late 2014, NASA, in conjunction with General Atomics, tested an Airborne Collision Avoidance System for UAS (ACAS Xu) on the civilian version of the Predator B with positive results (NASA Armstrong 2015). However, there are drawbacks to these systems. The first is size and weight. While improvements in technology have allowed these systems to become smaller than their manned aircraft counterparts, the size and weight are still factors when working with smaller UAS. The second issue is cost. Due to the relatively high cost of these systems, most operators of smaller UAS would not be able to afford the purchase and installation of a TCAS or ADS-B system, thus reducing the effectiveness of the “big sky” picture of all UAS and RPAs operations. Instead of the consumer absorbing the cost of expensive tracking systems, the UAS manufacturer absorbs the cost of geofencing, which is a less cumbersome system and also less expensive. Geofencing uses GPS or radio frequency identification (RFID) technology to create a virtual geographic boundary, enabling software to trigger a response when a UAS either enters or exits a particular area. With this technology, UAS operators can either build “containers” to keep their aircraft inside or outside a particular area and also set altitude limits. Manufacturers are also able to “hardwire” off-limits areas, such as nuclear power plants or military installations, based on inputs from the FAA. With regular updates, these areas can be kept current as airspace changes over time. With this technology, RPICs can ensure their aircraft remain within their designated airspace and prevent inadvertent flights into unauthorized areas. However, as with any other type of technology, this is not a fool-proof solution. While responsible RPICs much like their manned pilot counterparts would observe and abide by geofenced areas, there will always be those who, for whatever reason, either disregard geofenced areas or “hack” into their UAS to override any hardwired triggered responses. This would then negate any safety features of the geofencing technology, once again making the UAS a potential hazard to other aircraft or ground obstructions. However, if properly implemented throughout all UAS and RPAs, any UAS that violates a geofenced area could be more easily identified as either a non-compliant or hostile aircraft for local or federal law enforcement to identify and neutralize. In addition to technological mitigation measures to enable autonomous UAS flight in the NAS, structural changes may also need to occur. In conjunction with researching the technologies that would facilitate the autonomous UAS flight in the United States, NASA, working with both private and public entities, has developed a ground-based detect and avoid system commonly referred to as the UAS Traffic Management (UTM) system. Under this concept of operation, all UASs are limited to operate from 200 to 500′ above ground level (AGL) in uncontrolled/lower populated (Class G) airspace (NASA UTM Fact Sheet 2017). This altitude envelope would prevent the UAS from colliding with most ground obstructions and operate below the majority of manned aircraft. Besides operating within a certain altitude range, all UAS would also need to have appropriate geofenced technology in order to remain outside restricted of special use airspace controlled by the FAA. Another requirement for the UTM compliant aircraft would be to have an operational ADS-B system in order to avoid not only other UAS but also manned aircraft which may descend into the “UAS zone.” Finally, as a requirement for this system to work, all UAS location/altitude data would need to be fed into a system, much like the FAA air traffic control system, in order for UAS to “sense” other UASs and manned aircraft. 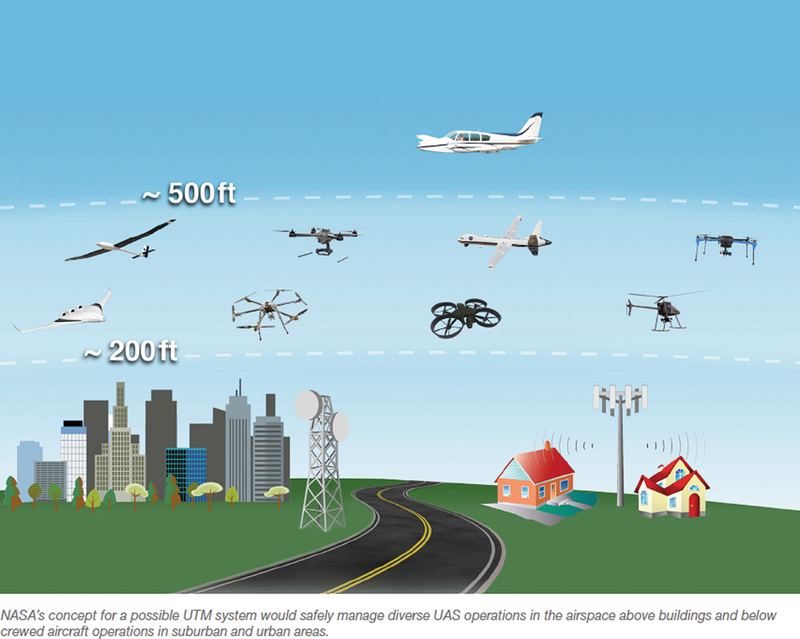 To feed into the UTM system, UAS would utilize the existing cellular network (Fig. 1) (Google UAS Airspace System Overview 2017). Under the UTM concept, certain zones or air corridors would exist, where autonomous UAS operations may take place unhindered by the potential for interference from manned aircraft. This concept presupposes significant additions to transportation infrastructure, including launch platforms as well as pre-positioned and linked up waypoints responsible for communicating and de-conflicting UAS operations within a certain area. To help overcome some of these current challenges and restrictions to operating UAS and RPAs in the NAS, the FAA established a Pathfinder Program. Pathfinder is a public-private partnership in which the FAA and private non-federal entities, together, attempt to tackle the obstacles to full integration of UAS in the NAS. Currently the Pathfinder Program’s focus is in three areas: urban operations, beyond visual line of sight (BVLOS), and command and control. All three of these areas are also critical to understanding how autonomous UAS can safely operate in the NAS and, ultimately, what autonomous UAS regulations should permit. For example, as part of the Pathfinder Program, CNN is exploring how UAS may be used to in populated urban areas, to safely operate over populated areas for newsgathering purposes. Instead of a news helicopter flying around a city to observe an accident scene, follow a police chase by air, or monitor traffic congestion, an autonomous UAS could accomplish all this and more in the future. Currently, if a news station or other media outlet or commercial enterprise had an approved waiver, they could accomplish the aforementioned tasks with a UAS and a RPIC and VO at the controls. However, requiring a RPIC and visual line of sight with these operations severely limits the ability and efficiency of reporters or other news sources to gather information if the UAS operator is required to travel to the scene. At the most basic construct of an autonomous UAS, a programmer could recognize a newsworthy situation and launch the UAS to hover and cover an emerging situation. This would put the UAS in control of its own flight path and deconfliction responsibilities. Another scenario in which an autonomous system could be beneficial in an urban setting is tracking and monitoring a crime. For example, if a dispatcher receives the report of a crime and that the suspects have fled the scene, an autonomous UAS could launch and attempt to locate the suspect. In a car-chase scenario, an autonomous UAS could follow the fleeing suspects instead of police cars which would lessen the risk of harm to the public and police officers. To experiment with BVLOS UAS operations, PrecisionHawk, a commercial UAS and data company located in Raleigh, North Carolina, is working on how UAS flights outside the RPICs direct vision might increase precision agriculture operations (PrecisionHawk 2015). One of the main programs tested is the low-altitude tracking and avoidance system (LATAS) which is a traffic management system for UASs. UAS set up with transponders and LATAS ground-based hardware and software was set to be tested to push the limits of BVLOS operations in agricultural and rural areas. The goal with autonomous UAS flights over agricultural areas is to provide the most accurate data to famers and other users in the most economical way as possible. Some critics may be wary of an autonomous system’s ability to sense and avoid danger. Just as Tesla has come under fire for its self-driving automobiles even as real-life has demonstrated that the autopilot in a Model X was more aware of the surroundings than the driver, autonomous UAS will likely face the same critiques (McCausland and Walters 2016). Current UAS such as the DJI Inspire relies on an onboard camera to relay information to the RPIC or VO. The effectiveness of the UAS to avoid obstacles and hazards is only as good as the RPIC or VO’s ability to see them. However, the ability of an autonomous UAS to avoid obstacles once detected is only as good as the programming and computing speed of the machine itself. The onboard camera may be used as a backup to the UAS’ sensors, or programming may allow the UAS to interpret what the camera detects, giving the autonomous UAS an extra layer of redundancy. Research, such as that being accomplished through PrecisionHawk, can assist in perfecting technologies, procedures, and systems to enable BVLOS autonomous UAS operations. The third Pathfinder initiative involves the Burlington Northern Santa Fe Railway’s exploration of command and control (C2) challenges in using a UAS to inspect rail system infrastructure along with the testing of BVLOS operations. One of the challenges facing the railway is that there is so much track spread across the entire continent. Around the world railroads are used as a means to transport goods and people to remote locations. Currently, railroad tracks are inspected by people. This is a time-consuming task with many concerns for worker safety. With the invention of UAS, now an inspector has the potential to be located anywhere in the world and view the results of an autonomous UAS flight to inspect tracks. The C2 issue involves programming and overseeing such a large endeavor to have UAS launch, fly, monitor, and transmit track inspection results. A large network of autonomous UAS could be set to follow an inspection timeline or goal with the ability to respond to a report of a potential track defect or emergency. Depending on the results of the above initiatives, there is a potential that the FAA could remove some or all of the current regulatory restrictions as new technologies and procedures are perfected. Ever since the Wright brothers’ flight over 100 years ago, it was assumed that a pilot would be in control of the aircraft. Once UAS took to the skies, it was still a requirement that a human being control the unmanned system. As stated, the original FAA regulations were focused on manned aircraft with a pilot in the cockpit. The current UAS regulations use these regulations as their foundational starting point, recognizing that exceptions needed to be made for aircraft without a pilot on board, hence the creation of the RPIC. To ensure the fidelity of the aircraft/pilot relationship for a UAS, the current framework for nonpublic UAS operation was specifically exempted from the requirements of manned aircraft and instead codified in Part 107. As discussed above, the Part 107 framework outlines the rules and procedures for UAS operations with the main focus on RPIC duties and responsibilities and allowances for deviations through the waiver process. Autonomous UAS takes this a step further insofar as the centrality of the RPIC becomes questionable. Assuming that technology can adequately address the safety concerns posed by the autonomous operation of UAS, the FAA will need to update and solidify the regulations and policies to facilitate autonomous UAS operations within the NAS. Before any modification to Part 107 was addressed, the first section to address is 14 CFR § 107.1 – Applicability. Would autonomous UAS operations be covered in Part 107 or would an entirely new section be created to distinguish between autonomous and manned UAS flights? 14 CFR § 107.3 – Definitions. The definition of “control station” specifies that it is the interface used by the RPIC to control the flight path of the UAS. A “visual observer” is someone used by the RPIC to assist in operations – to help see and avoid other air traffic and avoid objects. Both the RPIC and VO’s roles drastically change and are likely eliminated with autonomous UAS operations. 14 CFR § 107.12 – Remote pilot certificate. If a RPIC is no longer in the loop of an operating UAS, then such a certificate would no longer required to operate a UAS. 14 CFR § 107.19 – Remote pilot in command. The RPIC is the final authority to operate the UAS and is the person directly responsible for the UAS and its safe operation. The RPIC ensures the UAS is operating safely and complies with all regulations. Would this be replaced with the programmer or designer? 14 CFR § 107.33 – Visual observer. A helpful tool to existing UAS flights is the presence of a visual observer who can maintain visual contact with the UAS, scan the airspace surrounding the UAS for potential hazards, and maintain overall situational awareness. With “sense and avoid” technology, this would also no longer be required. Subpart C in its entirety – Remote pilot certification (14 CFR § 107.53 through 14 CFR § 107.79) would need to be reconsidered. Again, if the focus is on the programmer or designer, should the focus of regulation be on baseline software or hardware requirements? Without an RPIC, one major change required to the current FAA scheme will be to reverse the requirement to maintain VLOS with the aircraft. As discussed above, VLOS operations require the RPIC or a VO, without the aid of another device, to see the UAS to know its location; determine the aircraft’s altitude, attitude, and flight direction; observe the surrounding area for potential hazards; and ensure the UAS does not endanger the life or property of another. However, once the technology is developed and implemented and direct human involvement is no longer critical to routine UAS operations, this becomes an outdated paradigm. The current responsibilities of the RPIC require the pilot to actually “see” other aircraft and obstacles, but with an autonomous system, this human link is removed and must be replaced with an ability to “sense” and avoid the same potential dangers that a human would observe. 14 CFR § 107.3 – Definitions. The definition implies that it is the responsibility of the RPIC and the VO to see and avoid other air traffic or objects in the air or on the ground. With an autonomous system, there is no longer a human directly involved in the UAS loop to ensure such objects are avoided, and thus it must become the responsibility of the UAS itself to “sense and avoid” potential hazards. 14 CFR § 107.31 – Visual line of sight aircraft operation. The current requirements within this section require an operator to know the location of and properly monitor the UAS for safety of flight issues. During an autonomous UAS flight, there is no line of sight requirement since the UAS is its own system, and it has its own visual (or electronic) line of sight wherever it goes. Manned aircraft, depending on the airspace they are operating within, require a transponder for ATC to identify the aircraft, its location, and altitude. Such a transponder or identification system can also be required for UAS to operate independently of a RPIC, so the UAS can transmit identification and locational data to other aircraft to ensure safe operation even within a designated airspace. If autonomous UAS was required to have transponder systems, ideally such systems would be required to have the ability to interpret the other signals received to allow the aircraft to respond. At the heart of “see and avoid” or “sense and avoid” is the concept of yielding the right of way to avoid collision. Currently, yielding the right of way requires that “[e]ach small unmanned aircraft must yield the right of way to all aircraft, airborne vehicles, and launch and reentry vehicles. Yielding the right of way means that the small unmanned aircraft must give way to the aircraft or vehicle and may not pass over, under, or ahead of it unless well clear.” While 14 CFR § 107.37 does not specifically mention that it is the RPIC’s job to maintain a safe operating distance, it does state that “no person may operate a small unmanned aircraft so close to another aircraft as to create a collision hazard” (emphasis added). This implies that each RPIC is responsible for yielding the right of way to all aircraft and to keep the UAS from creating a safety problem. To abide by this lynchpin safety requirement, instead of just transmitting positional data, any UAS transponder system would need to acknowledge the signals of any other aircraft, thus enabling the aircraft to yield the right of way as required. For successful autonomous operations, the systems must possess the ability with which to communicate in real time so that the autonomous UAS can deconflict travel paths and altitudes and avoid collisions on their own. Once this is possible, 14 CFR § 107.37 will require slight modification to define what is meant as “well clear” of other objects and to allow for no aircraft (and not “person”) to operate so close to another aircraft as to create a collision hazard. A related proposal to enable BVLOS UAS flights is to authorize certain zones or air corridors where autonomous aircraft may fly unhindered by the potential for interference from manned aircraft, as suggested by NASA’s UTM project. It will be important for UAS to have parameters to operate within, as a human RPIC will no longer be present to observe and detect possible hazards. One way to do this would be for regulators to consider allowing UAS to operate within set distances from launch platforms and pre-positioned and linked up waypoints. As suggested above, while this would require investment in infrastructure, if control stations or check-in waypoints existed, the UAS would merely require a means to communicate with such stations responsible for de-conflicting UAS operations within a certain area. Regulations would provide the right and left limits of this UAS box but also permit freedom of movement within it. 14 CFR § 107.51 – Operating limitations for small unmanned aircraft. As currently written, the RPIC must ensure the UAS does not go more than 400 ft above the ground, must maintain certain distances from objects, not travel faster than 87 knots, and only fly when visibility is at least 3 statute miles, and the RPIC must ensure the UAS remains at least 500 ft below clouds and at least has 2000 ft of horizontal separation from clouds. The modification of operating limits will likely be set by the level of technology that exists within the UAS itself and the infrastructure as developed to support autonomous UAS flights. A scenario might exist where autonomous UAS corridors are created within congested or populated areas, and another set of flight rules exists for autonomous UAS in more rural or agricultural settings. Additionally, limitations or restrictions on the type of flights allowed within the air corridors may exist to control the airspace. Within such a designated area, UAS might also have an autonomous ground station to control multiple aircraft within it. The current FAA requirement is that without a waiver, one person may operate only one unmanned aircraft at a time. If the future of autonomous UAS operations relies on autonomous ground control or monitoring stations, then 14 CFR § 107.35 should be modified to allow for a reasonable number of UAS per monitoring station or allow for a specific number of aircraft airborne in a certain airspace at any given time. Even with operations within a constrained area, regulators should also consider whether certain authorized public servants, such as law enforcement or ATC, should have the ability to interfere and take control of an autonomous UAS for safety or emergency purposes. If such interference is authorized, all autonomous systems must possess the ability for human involvement on the loop, as needed. 14 CFR § 107.21 – In-flight emergency. Such emergencies typically require immediate action by the RPIC to avoid a mishap. Sometimes operators with ill intent may mean to utilize a UAS to cause a mishap. In such cases, law enforcement should have the ability to appropriately respond to the situation which may include taking over control of an autonomous UAS. Regulators should factor the future purposes of autonomous UAS flights into the analysis of regulation changes. The scope of UAS missions is broad and may include package delivery, monitoring traffic congestion, or tracking wildlife. Likely operations such as these would require a UAS to fly over people and congested areas, which is currently not permitted under 14 CFR § 107.39. The FAA will also not grant a VLOS waiver if the UAS is intended to carry property or cargo for commercial use or hire. These policies could be reversed if coupled with notice requirements to nonparticipants and reasonable insurance minimums. 14 CFR § 107.23 – Hazardous operation. No person is currently authorized to allow an object to be dropped from a small UAS in any way which may create an undue hazard to people or property. However, who determines what an undue hazard to people or property is? One of the many commercial aspects to autonomous UAS operations is the ability to deliver goods, which could include dropping objects or packages from a UAS since if the UAS is required to land to deliver the package, a more hazardous situation may be created. 14 CFR § 107.25 – Operation from a moving vehicle or aircraft. No person may currently operate a UAS from a moving vehicle unless it’s flown over a sparsely populated area, and it may not be transporting property for compensation or hire. Since most UAS in existence today have a short flight duration limited by battery life, image a situation where a package delivery truck travels a route and has UAS takeoff from the truck, deliver a package, and then return to the truck for another package. This could extend the reach and save time for the delivery company. 14 CFR § 107.205 – List of regulations subject to waiver. With the removal or modification of operating limits, the requirement for certain waivers may no longer exist or should be modified to include the new restrictions for autonomous UAS flight. Likewise, currently, if the FAA has not granted a waiver, a RPIC must operate a UAS during daylight hours and if a waiver is granted for night flights, the UAS must have anti-collision lighting and be visible for 3 statute miles. Depending on the technology available, other regulations may need to be modified to facilitate full-spectrum autonomous operations. For example, depending on the level of technology of the autonomous UAS, some may be able to fly at night with no restrictions, while others are limited to daytime operations only. 14 CFR § 107.29 – Daylight operation. This section is specific that no person may operate a UAS during night and no person may operate a UAS during civil twilight unless certain conditions are met. Civil twilight operations are authorized if the UAS has anti-collision lighting and is visible for 3 statute miles. Other than the requirement to have anti-collision lighting for twilight operations, no other Part 107 regulations exist detailing what must be visibly observable on the UAS. Aircraft and UAS are much more easily identifiable during daylight and much more difficult to detect during twilight and night since human perception is distorted by the lack of light. The purpose behind the lighting requirements is to allow the RPIC to maintain visual contact with the UAS and to also allow for other UAS operators within the area to identify and avoid a potential hazard. However, if there is not a person visually observing the UAS, then is lighting required? This circles back to the requirement that autonomous UAS must have a way to identify themselves to other airborne objects around them. This could be done with lights, and then the autonomous UAS must have a way to visually detect such lights, or it could be with some type of transponder system. 14 CFR § 107.205 – List of regulations subject to waiver. Daylight-only operation is a condition where a waiver can be requested and is one of the most granted waivers. Achieving full-spectrum autonomous UAS flight in the NAS requires balancing safety and security with operational flexibility. As operational parameters are loosened, perhaps additional emphasis needs to be placed on preflight protections. As such, less stringent UAS requirements in this realm might need to be revisited with respect to autonomous systems. Regulatory considerations in this regard might include reevaluating the minimum requirements for UAS operations, inspections, and maintenance. Currently, before every UAS flight, the RPIC is required to conduct a preflight familiarization and inspection of the aircraft to assess the operating environment, risks of the flight, and functionality of the UAS to accomplish its mission. Without a RPIC, these inspections must still occur before flight but perhaps with additional safety checks, all of which could become the responsibility of the UAS itself, to ensure flight readiness. Such revisions could align more with the requirements for manned aircraft outlined in 14 CFR Part 91, Subpart E. In a manned aircraft, if a pilot isn’t already in contact with an air traffic service to declare an emergency, the pilot at least has a transponder to squawk for an emergency. In a UAS, the RPIC or VO should remain constantly in contact with the UAS and be able to detect if an emergency situation arises and properly address the situation and report a mishap if required. If an autonomous UAS went missing on a flight either because it went off course or crashed, how would we know? Would we ever know? 14 CFR § 107.5 – Falsification, reproduction, or alteration. This section would need to address the programming or re-programming of an autonomous UAS without a license or the proper certification. This could help prevent runaway UASs and ensure those UASs that are not properly certified are allowed to fly. One of the main safety concerns is the ability to monitor, and control if needed, autonomous UAS, and if people are modifying an autonomous system without approval, it could thwart the system created. 14 CFR § 107.7 – Inspection, testing, and demonstration of compliance. All of this hinges on a RPIC, owner, or operator being present to present an FAA administrator (or other authorized agency, such as law enforcement) with the requested documents or records to comply with RPIC and UAS registration and operation. Like manned aircraft mandatory inspections, a system should be put in place to ensure the air worthiness of autonomous UAS. 14 CFR § 107.9 – Accident reporting. Currently the RPIC has a maximum of 10 days to report to the FAA any mishap with serious injury or damage to any property. Without a RPIC it may become the duty of the UAS owner to report such mishaps. 14 CFR § 107.15 – Condition for safe operation. Before each flight, it is currently the RPIC’s responsibility to ensure the UAS is safe for flight operations. Instead of leaving “safe operation” as an ambiguous phrase, autonomous UAS flights may require a more detailed description of what is and is not considered safe. 14 CFR § 107.21 – In-flight emergency. This section currently allows the RPIC to deviate from these rules to the extent necessary to meet the emergency situation and upon completion of the emergency to send a report to the FAA detailing the deviations. The programming of the autonomous UAS must be able to respond to emergencies. The level of response programming required may depend on the type of UAS, location of flight, and mission. 14 CFR § 107. 49 – Preflight familiarization, inspection, and actions for aircraft operations. This section could possibly best be addressed by mandatory programming minimums for autonomous UAS. Set programming would delineate what a UAS was required to detect or observe before taking off for an autonomous flight. If such programming is not available, it may become the responsibility of the person who owns the system or has the ability to insert themselves into the loop if required. Who is ultimately responsible for safety of flight, whether some version of an RPIC, the UAS programmer, designer, or traffic manager will also drive who is liable to those injured in the event of an accident. Currently, while UAS liability insurance is available, it is not mandatory. Generally, commercial UAS operators will obtain insurance to ensure their business venture is protected in case of a mishap and just like most any other insurance plan, many different levels of coverage and deductibles exist. While the cost to replace a UAS if damaged or destroyed may be minimal, insurance to cover the liability of the operator or owner may be the key to protecting a business. However, insurance requirements should be reevaluated before fully autonomous UAS is authorized to operate within the NAS. Most of the regulations listed under the preflight and flight safety section above are going to drive the insurance industry since those safety standards would become the guidelines for insurance requirements. As new systems and infrastructure are developed, there may be an increased level of risk associated with a new way of operating. Additionally, it could be argued that innovation requires risk and that the proper insurance is a way to fuel innovation while tempering it with the appropriate level of caution. Aircraft insurance has significant precedent. For example, commercial air carriers operating within the United States must have liability insurance. 14 CFR Part 205 outlines the requirements and applicability of aircraft accident liability insurance for direct air carriers. While no federal regulation similar to commercial aircraft carriers exists for general aviation aircraft owners, each state independently sets liability insurance requirements (U.S. Government Accountability Office 2015). Especially in the realm of autonomous commercial UAS operations, the requirement to have liability insurance should be considered as part of the construct for autonomous UAS operations within the NAS. The primary goal of aviation safety is to avoid midair collisions. As UAS become more technologically complex, capable of flying autonomously while “sensing and avoiding” midair collisions, regulatory changes must be made to keep pace that enable such operations while also addressing safety concerns. To the extent that this can be accomplished in unmanned autonomous flight through advanced technological means, removing the RPIC as the central actor in regulation will be critical. Removal of the RPIC, however, requires its replacement with reliable UAS programming, a robust system of airspace management, and significant changes to the current regulatory system to take into account all the complexities of UAS. Specifically, the FAA must fully redefine operating parameters, required infrastructure, and processes for autonomous UAS. The regulatory changes required to allow for safe autonomous UAS operations must permit aircraft identification, altitude and location detection and include more rigorous airworthiness requirements, such as set maintenance and inspection schedules. In addition to more refined operating parameters, the NAS and its control procedures would need to be redefined to include autonomous UAS. Updates to infrastructure and ATC processes are a few of the significant changes that would need to occur. Only when these foundational changes are made, will safe, efficient, and effective autonomous UAS operations be possible in the US NAS.